Lafayette, CA: C&T Publishing, c2017. This is an excellent read, one I'm happy to have finally got my hands on. Nicole Mallalieu is an Australian sewist, designer and teacher, and she has created a book that is perfect for self-taught sewists. It covers basic sewing information: terms, tools and techniques, with lots of photos. But it also then goes on to explain how to easily alter patterns, how to change details like pockets, how to best perform sewing tasks like inserting zips or attaching collars, and even shows how to change patterns substantially - how to change a back zip closure to a front button one, for example, or how to completely change a neckline. It moves from simple to quite complex. 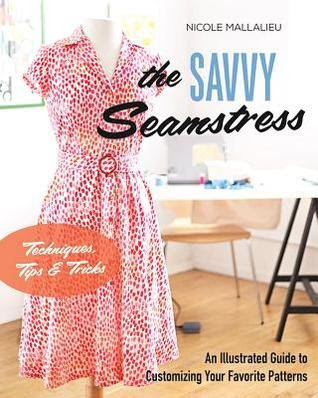 There were useful tips in this book for sewists like me, who know how to do most basics, how to use a pattern and alter it in minor ways, but want to do more. She covers how to make a big change, and all the resultant details that need looking after: changing a closure or neckline means also altering the pattern's facing, seamlines, or perhaps darts. There are tons of illustrations and clear explanations of all the steps needed to effectively design your own dress from a basic sheath dress pattern, say. The chapters are organized into themes: Basics, Pockets, Button plackets, Necklines, Zip Closures, Waistlines, Yokes, Collars, Sleeves. There are many ideas and lots of instruction in each chapter, and depending on your experience and your interests, you might use some of the chapters more than others. But I found that for a sewist who is past being a rank beginner but not at the stage of being able to draft one's own patterns from scratch, this book is full of gems. It's clear and easy to use, and really inspiring. There are no patterns of any kind in this book, the focus is on the techniques needed to use and change the patterns you already have. This is definitely a good title for the sewist's bookshelf, especially if you don't have anything in this topic area yet. It's very user-friendly and not at all intimidating. Oh no, not another great book! I like the words you use in your description - 'not intimidating', 'user-friendly', 'full of gems', 'inspiring'. Unfortunately not available at my library, so I will have to think about this. I had to wait for this one to become available but finally got one at the library so hope you'll be lucky too.